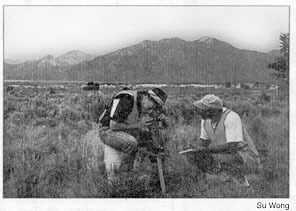 Several local newspapers published stories about the training program in Taos as well as the NASA group Achievement award received by several Bureau of Geology staff. Mike Fossum, left, and Leland Melvin are part of a NASA astronaut team that recently visited Taos for geologic training. 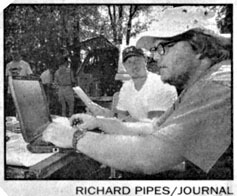 THE BASE: New Mexico Institute of Mining and Technology graduate students Rod Stanton, right, and Tony Lupo work at "Mars Base" on the lawn of a Taos bed and breakfast recording data the astronaut candidates in the field radioed back to them.